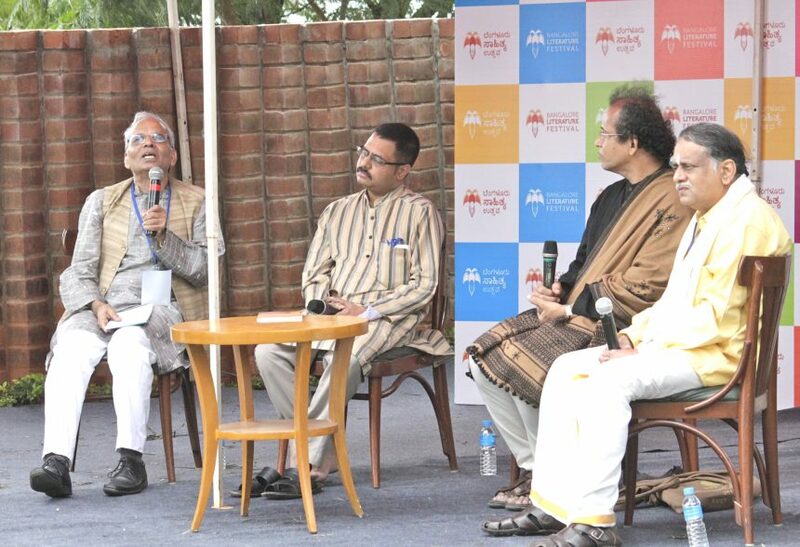 Dr. Shatavadhani R Ganesh, a practitioner of the art of avadhana, a polyglot, an author in Sanskrit and Kannada and an extempore poet in multiple languages began the session by saying that it’s very heartening to attend and moderate a session on Sanskrit. He says ‘Sanskritam’ is a wonderful language. Common dialect can be used in Sanskrit as it is used in English. Prof. Radhavallabh Tripathi who has served as Vice-Chancellor of Rashtriya Sanskrit Sansthan, a Deemed University at Delhi for five years (2008-13) says that when he started a distance learning course in Sanskrit few years back, there were around 1000 people who showed their interest to learn the language. Those who can write in Sanskrit can write in multiple languages too. He himself writes stories in Hindi. A hundred periodicals are still getting published in Sanskrit. There are still subscribers who subscribe to it and read it. Talking about the past, he mentioned that in 1928, a Sanskrit poetess who was based out of Mumbai heard the cry of people demanding Satyagraha and decided to write a new form of Gita called Satyagraha Gita. Her book could not be published in India when she completed it in 1930. However, she was published from Paris. After independence, the book was translated in several languages and brought back to India. About the challenges in Sanskrit, Shankar Rajaraman, a psychiatrist by profession who writes Sanskrit poetry says that a challenge is a call to prove something though it is not binding to respond to it. He says responding to challenges diminishes his energy. He would prefer to write a poem rather than reply to someone who is questioning why he is writing poetry, and why he doesn’t do something else. He also said that a major challenge is to find people with whom he can share his work. He prefers sharing it only with few of his friends. He believes he doesn’t need to send his work to everyone. He doesn’t depend on someone else for being joyful. The greatest challenge he mentioned is the challenges from the other contemporary Sanskrit writers. T.S. Viswanathan, who is presently engaged in spiritual and motivational speaking for the general public and corporates says the readers will increase if the people show some interest in learning Sanskrit, and that is when the creativity in a Sanskrit writer will increase.